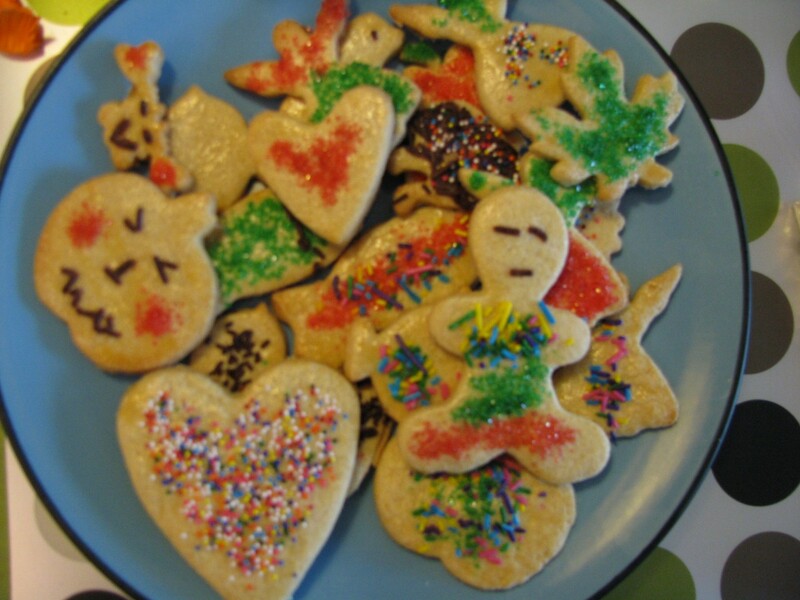 These cookies are very popular during Easter and Christmas time in Germany. Kids love to make them and of course they like to eat them. Mix all the ingredients for the dough in a big bowl and form dough with your hands. Make sure that butter/margarine is melted before working with it. It’s best to roll the dough with a rolling pin and use a little flour while working with the dough so it won’t stick to the table or your hands. Use cookie cutters to cut out different shapes and place them on a baking tray (cover baking tray with parchment paper first). Brush cookies with a little egg using a pastry brush and drizzle chocolate, candy or coconut sprinkles on top before baking. Then bake for 10-12 min in per-heated oven (200 C/400 F). Let cookies cool on a cooling tray or plate.